Samsung has announced on the sidelines of its participation in Computex the notebook PC Pro 9 Pen Pen, unlike other laptops in the same category, the new computer with the joints allow the 360-degree rotation, such as laptops in the category of Lenovo Yoga Yoga . The screen's hinges allow rotation and use of the device as a tablet or laptop. The South Korean company combines mobile screen interfaces and S Pen technology to become an integral part of the Notebook 9 Pro. The Pen Pen has a total of 4000 levels of pressure and pen tilt capability for shading in a way that is similar to the latest Microsoft Surface Pen. The computer also comes with the Air Command software for drawing, writing notes and editing documents. 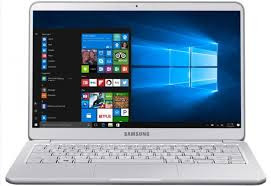 Samsung has made sure that its Pen Pen is fully compatible with Windows Ink, allowing users of the Notebook 9 Pro to use the pen across the Windows 10 operating system. The company plans to launch two models with different screen sizes from the Notebook 9 Pro, which is 13.3-inch and 15-inch, and will include both the latest Intel Core i7 processors with frequencies up to 3.5 GHz, the 13.3-inch with 8 GB of RAM, while the 15-inch version comes With 16 GB RAM. All models include 256GB of internal SSD storage space, a 15-inch Radeon 450 graphics card with 2 GB of RAM, a USB-C port for fast charging, two traditional USB ports and an HDMI port, And support for external storage space via microSD port. The front camera on the device supports Windows Hello and Face Recognition support to log on to Windows 10. The company has not yet provided the date of the computer's arrival to the market or the proposed price of the Notebook 9 Pro, but is expected to arrive later General.